Russian Talmudist and writer; born in Wilna Oct. 1, 1817; died Dec. 13, 1885. He studied under Manasseh of Ilye and Isaac of Volozhin, who were highly impressed with his ability. 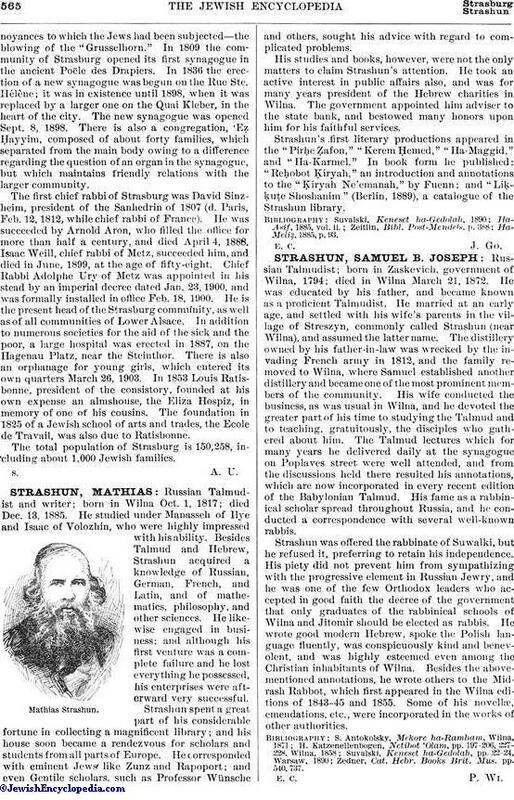 Besides Talmud and Hebrew, Strashun acquired a knowledge of Russian, German, French, and Latiń, and of mathematics, philosophy, and other sciences. He likewise engaged in business; and although his first venture was a complete failure and he lost everything he possessed, his enterprises were afterward very successful. Strashun spent a great part of his considerable fortune in collecting a magnificent library; and his house soon became a rendezvous for scholars and students from all parts of Europe. He corresponded with eminent Jews like Zunz and Rapoport; and even Gentile scholars, such as Professor Wünsche and others, sought his advice with regard to complicated problems. His studies and books, however, were not the only matters to claim Strashun's attention. He took an active interest in public affairs also, and was for many years president of the Hebrew charities in Wilna. The government appointed him adviser to the state bank, and bestowed many honors upon him for his faithful services. Strashun's first literary productions appeared in the "Pirḥe Ẓafon," "Kerem Ḥemed," "Ha-Maggid," and "Ha-Karmel." In book form he published: "Reḥobot Ḳiryah," an introduction and annotations to the "Ḳiryah Ne'emanah," by Fuenn; and "Liḳḳuṭe Shoshanim" (Berlin, 1889), a catalogue of the Strashun library.